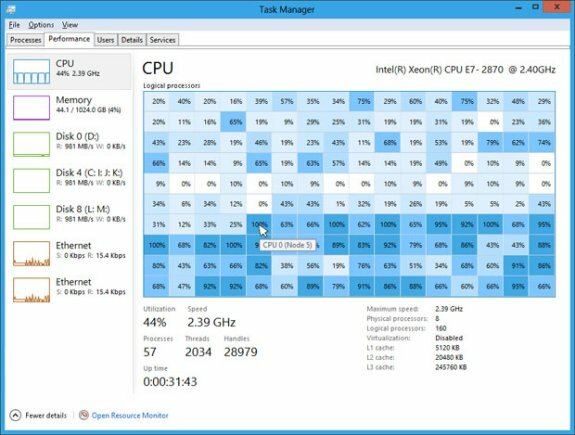 The Tech Report writes Microsoft has developed new monitoring tools for the Windows 8 Task Manager that are tweaked for many-core systems. We've already seen how the Task Manager has been massaged to make errant processes easier to identify and kill. Now, the Building Windows 8 blog has revealed changes to the performance tab designed to improve its usability in systems with multiple logical processors. Microsoft uses the example of a 64-core system, which fills the traditional Task Manager with a bunch of tiny CPU usage graphs that are difficult to read. In place of those graphs, the new Task Manager uses a color-coded "heat map" to characterize the utilization of logical processors. Of course, line graphs haven't been completely removed from the performance tab. A column of simplified graphs tracks overall CPU utilization in addition to memory, disk, and networking usage. More detailed monitoring should also be available through the Resource Monitor, which is still linked at the bottom of the performance tab.